Takatsuki Ryo always knew he was different from everyone else. It was more than the outdoors survival training his father had given him years ago. It was even more than the martial arts skills he had learned over the years. After an accident when he was young, Ryo's hand has always healed exceptionally fast, but he never really thought much of it. That is, until some violent people enter his life, threatening everything he holds dear and challenging his very sanity. From the creator of the explosion-laden movie, Spriggan, comes an all-new sort of sci-fi adventure, as a young group of technologically enhanced teenagers come together to defend their lives as they attempt to uncover the mystery of their origins. Ryo was living a rather average life before Shingo Hayato transferred to his school. Before then, he lived with his mother and spent most of his time with his childhood friend, Akagi Katsumi. While she's a bit overprotective of Ryo, Katsumi is tomboyish enough for him to appreciate her company. However, Hayato's arrival in Ryo's life marks the beginning of major changes in the way Ryo perceives himself as well as his friends. When Ryo first meets Hayato, the new arrival displays nothing but unreasonable contempt for Ryo. The first thing Hayato does when he gets Ryo alone is to challenge him to a fight, which is also the first time Ryo begins to suspect that there may be more to his right arm than just an accelerated healing ability. When he comes close to Hayato, an electric shock runs down his arm, almost as if it were resonating with Hayato in some way. 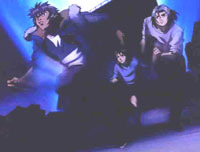 The fight between Hayato and Ryo is interrupted by Katsumi and a group of teachers, so Hayato flees, but not before he notices a connection between Ryo and Katsumi. Later that night, Katsumi goes missing and Ryo is sent to find her. However, he's going to discover more than he bargained for when he finally locates Katsumi. Eventually, he'll discover that the group behind all of his woes is a shadow organization known as the Egrigori. These dark figures have their own plans for ARMS, and you can bet they don't involve anything nice. Most of the fun of this series comes from the mystery surrounding the history of the characters and the true nature of ARMS, so I'm not going to go into much detail concerning the powerful weapons. They seem to have traits common to both organic and inorganic objects, and they possess incredible destructive potential. Also, they are almost always grafted onto people in place of a limb - which doesn't necessarily have to be an arm, despite their misleading name. There's far more to ARMS than merely super-powerful limbs, for the nanotechnology they incorporate has some very interesting surprises in store for Ryo and his friends. This is a relatively recent series, and it promises to have some excellent animation for its frequent fight scenes. With a simultaneous manga and anime release schedule from Viz, there's going to be plenty of ARMS action for all. There are already two anime DVDs and five comic book volumes available now, with more on the way and a graphic novel in due time. Fans of Spriggan who are looking for a more involved science fiction story should be pleased to get this title in their hands -- I know I am. 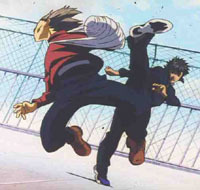 The main character of the series, Ryo is a levelheaded person who seems to have the qualities of a natural leader. When in trouble, he focuses on finding a solution rather than worry about a problem, and thus he's pivotal in getting his friends out of tight spots. Katsumi grew up with Ryo and they remain steadfast friends even after Ryo discovers his arm's dark secret. Similar to Ryo in that she is bright and calm, she is valuable to the anti-Egrigori group even without super powers of her own. Hayato enters the series hoping to end Ryo's life, but soon enough realizes his hatred is misplaced. He knows more of the ARMS project than any of the other four, and helps explain to Ryo and Takeshi exactly what they're up against. His fighting skills are on par with Ryo's, and he's quick to anger. Takeshi is nervous and somewhat of a coward at first, and only time will tell if he ever accepts his ARMS (in his case, enhanced legs) as a part of himself. He lost his legs after getting hit by a car trying to save his sister, and she feels responsible for all the bad things that have happened to him since. The female of the group of four ARMS, Kei has enhanced vision due as a result of her ARMS. Reluctant to trust Ryo at first, he eventually wins her as a friend and ally against the Egrigori.